"Bonsai in the Middle--Detachment and Incorporation"
This photograph was taken on a sunny spring weekend at the Japanese Friendship Garden in San Diego, California. The photographer is a graduate student from Japan. This photograph highlights two aspects of a globalized society—detachment and incorporation. One aspect of globalization, detachment, appears between the human subjects—white female visitors and a Hispanic/Latino male landscaper. The relationship between race/ethnicity and occupation has become more rigid in the United States especially in states like California which have large and continuous flows of immigrants. With an increasingly polarized service economy, the opportunities and the mechanisms for the immigrant working class to move upward have become minimal. Therefore, the provider and the consumer of the culture become fixed status without little fluidity in between. The second aspect of globalization, incorporation, occurs between the subjects and the photographer, who happens to be a foreigner(Japanese). Globalization has brought together people of various classes, races, ethnicities, nationalities, and educational attainment to a common place. Had it not been for the globalization of culture, bonsai would have remained a rather solitary activity of the elderly male Japanese leisure class. (Bonsai is an art of cultivating tree branches in a small plant pot that originated in China and has been appreciated by the Japanese ruling class for more than a thousand years.) With the growing interests in Asian aesthetics and practices, especially among the Western middle class in the past several decades, bonsai has attracted many people and has joined their forerunners—cherry blossoms and stone gardens—in the global arena. The consumption of traditional foreign culture by the middle class in the West has redefined bonsai and opened new markets—labor as well as consumer market—abroad and also in Japan. The globalization has enriched cultural diversity and thus provided the wider public with the tools for better mutual understanding. However, it has also disfranchised people at various levels of society, as depicted by the boundary drawn between the human subjects within the presence of the bonsai, or the very factor which ought to be a source of mutual understanding. Thus, the name "Friendship Garden" is ironic. This photograph captures how each of us living in a globalised world is taking part in the process and cannot simply be “bystanders” or “critics” of the phenomenon. Furthermore, we need to take into account how we are both benefiting from the phenomenon as well as contributing to the fragmentation of a globalized society. Bus terminal is always full of sociological insights. The terminal of mass transportations, whether it is of bus, airplane, or train, is the point of exchange. It is not only where different buses (or cargos) meet, but it is also the intersection of people and their values. In this photograph, a gentleman in the rear is trying to sell a golden vase and a lady in the foreground colorfully woven clothes. Where there is a line of passengers, there is a vender. Customers are always sought regardless of time and space, and a market opens where there is a crowd of people. The informal economy is so prevalent in the “Third World” societies that it has gained recognition by tourists as well as by locals, making it the norm of daily transaction in these societies. Some people dislike the hassle of the vendors, but others enjoy the human interactions and enchanting bargaining that are long gone in many of the industrialized societies which are increasingly dominated by chain stores and online shopping. Thus, the informal economy serves people in different ways. For locals, it provides necessities to sustain their everyday lives, and for the insecure crowd of tourists from the “developed” countries, it provides the comfort and the thrill of human interactions. 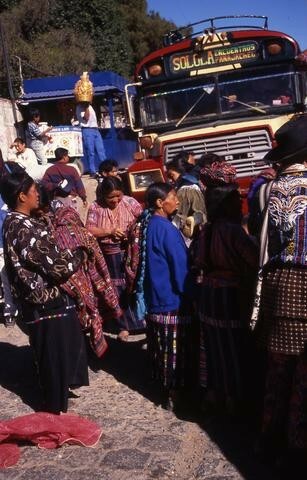 Further, in the foreground of the photograph, we notice that there are smiling faces of the passengers waiting to board the bus. Their smiles infer a friendly conversation. They could be the regulars sharing stories of everyday lives as a mother and wife as well as a laborer. These casual conversations allow people to find the common ground and reassure their sense of belonging to the community. How about the mass transportation that is not in this photograph? In other words, what is the image associated with the mass transportation in the “developed” countries? In a car-oriented society such as Phoenix (and a number of cities in the United States), the image attached to bus is relatively negative. It is far from the lively and colorful image depicted in this photograph. Rather, the bus terminal is often located in the area which is considered as “not a ‘nice’ neighborhood” if it is a long distance bus. The commuting bus is often equivalent to “inconvenience”, and as such, it is a powerful depiction of class divide. Furthermore, the rich interactions that emerge at the terminals as well as on the buses are often simplified by those who care less to hop on the bus. In densely populated cities like Tokyo, bus is a crucial transportation which supplements the rail, and yet as infamous as the commuting trains are, the rush hour buses are preferred to be avoided whenever possible. Considering the heavy traffic, relatively punctual and frequent schedule promises passengers the convenience, but rarely do we encounter smiles or even a hint of conversation. Instead, the buses are often filled with dull and tired faces that are seemingly dreading to start yet another long day of work. Bus, as a result, is a culturally distinct vehicle. The meaning attached to the mass transportation varies by societies. Therefore, the atmosphere of the bus terminals is socially and culturally embedded. It is the point of intersection where different values meet as well as the point where culturally specific values are expressed and emphasized.